A comprehensive look at the cinema’s love affair with the planet Mars! My thanks to long time long distance friend Thomas Kent Miller for sharing his literary dreams with me. God bless you, Tom! Mars is one of the Earth’s nearby neighbors and since its discovery by a stargazer whose name is lost to history has been a source of fascination. In 1877 Italian astronomer Giovanni Schiaparelli discovered what he believed were canals on the surface of Mars. Science fiction exploded! Writers such as Edgar Rice Burroughs wrote of civilizations on the surface of Mars, while HG Wells and others saw it as a threat by invasion. The movies ate up those stories and more. In this book, Thomas Kent Miller explores these depictions of life on or from the red planet. This isn’t just a matter of a few beloved films. This is a look at Mars in the movies from the silent era to the age of CGI. Tom also looks at Orson Well’s infamous Halloween broadcast of War of the Worlds on radio which nearly caused riots—or so it is rumored. As the reader peruses the book, take the time to appreciate the work and research that made this volume possible. 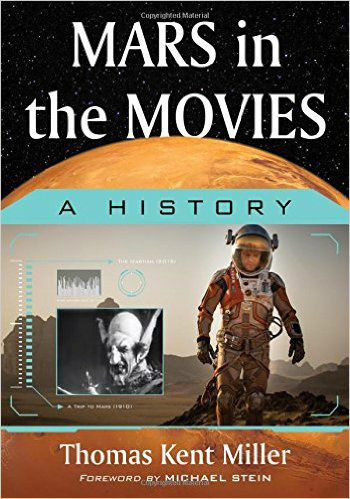 By looking at depictions other than an individual reader’s favorite movie, one can see how the legend of life on Mars grew into the blockbuster films of today. Tom, I will give you five stars. This was obviously a lot of effort! God bless!